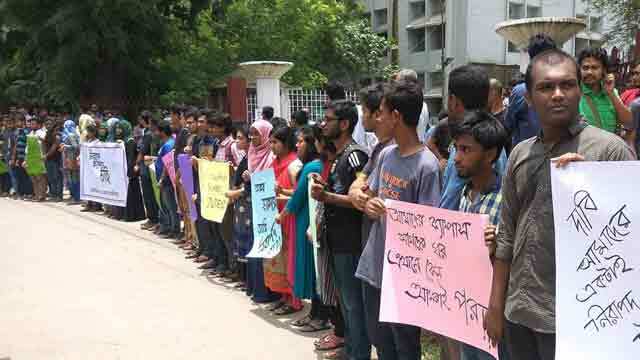 Dhaka, July 11 (Just News): A teacher of Dhaka University today threatened to call the police on students pressing for release of a friend who is in police custody for involvement in the quota reform movement. Prof AKM Jamal Uddin, a teacher of the Sociology department, threatened the students of his own department when the students were demonstrating this morning. He took pictures of the protesting students, threatened them with consequences and to call the police if they do not stop boycotting classes, claimed the students. “If I think you are barring my path, then I will call the police. I will call the proctorial team, now it’s up to you,” he said, according to an audio recording The Daily Star obtained. At that time another teacher of the department, Prof Samina Luthfa told him that the students are going to submit an application to the proctor. “I will take my classes and I would take steps as per regularities of the law if you do not take seat in my classes,” Prof Jamal said, according to the students. He again threatened to call the law enforcers. “There are some rules and regulation of the university and we have to run the university as per it,” he said. Earlier, students of the department took position in front of the department after boycotting their today’s scheduled classes. They also padlocked the gate of the department. “Boycotting classes cannot be the language of protest. It’s not the university’s duty to get a student released. You go to the high court and get a lawyer for him. If you manage to do so then the department would provide the cost,” Prof Jamal told the students. He also claimed to the journalists that those who were creating indiscipline are being detained. Asked where he got such information he said that they are assuming. Mentionable, some Chhatra League activists of DU’s Surja Sen hall handed Moshiur, a quota reform leader, over to the law enforcers after beating him on July 2.